Jasmine is a creative woman who works at DSC as a materials handler. She enjoys hanging out with her friends during her break times and sometimes after work as well. She said she recently went out for dinner at Monicals with a few of her housemates where she enjoyed a meatball sub. Her work group has been researching different countries and then going out to the different ethnic restaurants around town to taste the different types of foods. 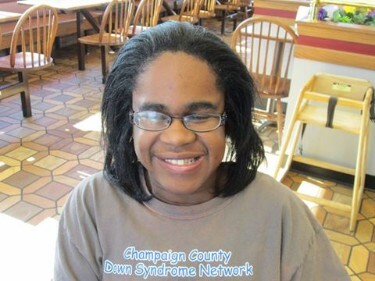 She also participates in Special Olympics bowling, and will sometimes play the bowling game on the Wii at home. She describes herself as social media fanatic because she is constantly scrolling social media sites like Facebook and Twitter. She also likes to make videos using an app on her phone that allows her to sing along to her favorite songs. Jasmine likes to create art, and has a very imaginative mind. She recently displayed some of her art at the DSC art show at Art Coop on August 4th. She stated that for her next project she is thinking about doing some type of landscape picture, perhaps even with a haunted house theme because she likes scary movies. Jasmine has the idea of creating a haunted house and having her friends dress up in scary costumes to help set the scene. Thanks for sharing more about you, Jasmine!